Dynamite Entertainment, a leading publisher of comic books and graphic novels, is proud to announce that critically acclaimed author David F. Walker will continue the legacy of Ernest Tidyman's iconic private detective John Shaft in an all-new comic book series, Shaft: Imitation of Life, illustrated by Dietrich Smith. The first issue will debut in February 2016 alongside Shaft's Revenge, the first Shaft prose novel in 40 years (also written by Walker), coinciding with the nationwide celebration of Black History Month. Imitation of Life takes place following the events of Walker's 2015 comic book miniseries, Shaft: A Complicated Man - a six-part storyline that won a 2015 Glyph Comics Award and was nominated for the Dwayne McDuffie Award for Diversity. After a high-profile case puts him in the headlines, private detective John Shaft searches for something low-profile to keep him out of the spotlight and out of danger… and takes a missing person case that proves to be more difficult than he thought. At the same time, he is hired to be a consultant on a low budget film that may or may not be based on his life, and proves to be as dangerous as any job he's ever had. But when there's danger about, John Shaft won't cop out - even if it means squaring off against sadistic gangsters that want him dead. "The idea for the new miniseries, Shaft: Imitation of Life, is one that's been in my head for a long time, and is something that I'm really excited about," says Walker. "This has been a really fun story to develop." David F. Walker is an award-winning journalist, filmmaker, and author of the Young Adult series The Adventures of Darius Logan. His publication BadAzz MoFo became internationally known as the indispensable resource guide to black films of the 1970s. His work in comics includes the series Shaft: A Complicated Man (Dynamite Entertainment), Cyborg (DC Comics), Number 13 (Dark Horse Comics), and The Army of Dr. Moreau (IDW/Monkeybrain Comics). New series artist Dietrich Smith, whose work previously graced the pages of Dynamite's Army of Darkness and Vampirella, says, "Of all the great action heroes I watched and imitated as a youngster, Shaft was at the top - a private eye with a chip on his shoulder, an attitude that dared anyone to try him. Having the opportunity to draw the smoothest man alive is something I'm very excited about." "David's first Shaft miniseries was fantastic, and he earned the Glyph Comics Award for Story of the Year. We're excited that he's returning for the Shaft: Imitation of Life series, as he's taking the character to the next level," says Dynamite CEO/Publisher Nick Barrucci. Shaft: Imitation of Life #1 is slated to release in February alongside Shaft's Revenge, the first official prose novel written by anyone other than the character's creator. David F. Walker says, "Writing the first Shaft book in forty years has been not only an honor and a privilege, it has been a dream come true. Ernest Tidyman created one of the most iconic and enduring pop culture characters in John Shaft, a legacy that has reached across multiple mediums, and sparked the imagination of millions of people, myself included." The premise of Shaft's Revenge: When the Godfather of crime in Harlem reaches out to Shaft for a favor, the hardboiled detective finds himself caught in a web of violence and murder. No one is safe as the bullets start to fly and the bodies start to drop, leaving Shaft with only two options: kill or be killed. It's a two-fisted tale of retribution as Shaft cuts a bloody path through city, settling old scores and faces the demons of his past. 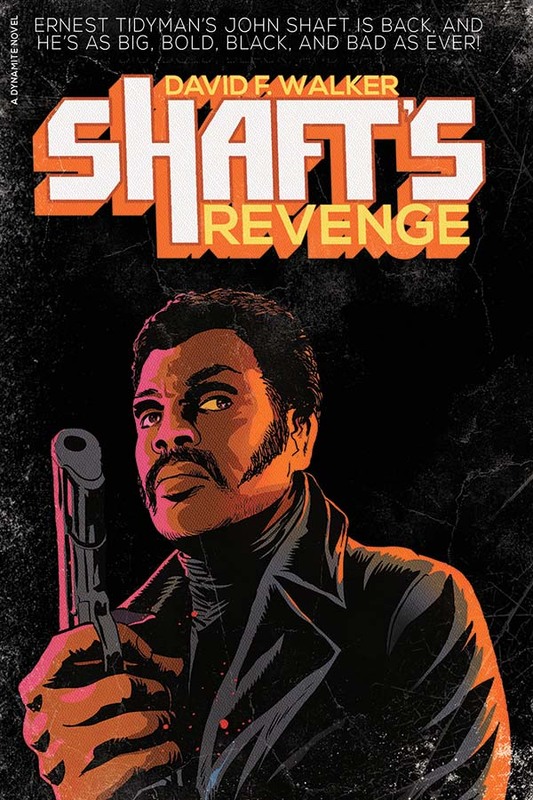 "My goal in writing Shaft's Revenge was to craft a hard-boiled work of pulp fiction that would honor the character created by Ernest Tidyman, as well as introduce him to new fans," says Walker. "For those that are already familiar with the exploits of John Shaft, I hope this new book is like a reunion with an old friend." Dynamite advance-solicited the Shaft's Revenge prose novel in Diamond Comic Distributors' October Previews catalog, the premiere source of merchandise for the comic book specialty market. Shaft: Imitation of Life #1 will be solicited in the upcoming December catalog; both the prose novel and #1 comic book issue correspond to release dates in February 2016. Fans are encouraged to reserve copies of Shaft with their local comic book retailers. Shaft will also be available for individual customer purchase through digital platforms courtesy of Comixology, Dynamite Digital, iVerse, and Dark Horse Digital. Please follow Dynamite Entertainment's official social media channels for the latest updates regarding project development and release dates.